There are many different types of plants whose leaves are referred to as bay leaves, but the true bay leaf is scientifically known as Laurus nobilis, and this is the nutrient-rich variety that we are discussing here. Many other leaves have a similar appearance and aroma to true bay leaves, but not the same nutrient content. This plant is an evergreen shrub or small tree that is native to the Mediterranean region. Laurel trees used to be everywhere in the region, but changing climates have shrunk their natural growth region. However, bay leaves have been a part of culinary and medicinal culture for thousands of years, dating back at least to Roman times. The uses of bay leaves including grinding the leaves into a spice to flavor soups and stews, but the leaves are most commonly added in whole form as a flavoring for certain Italian dishes and are then removed or used as a garnish. Whole leaves are not commonly consumed. There is not an extensive range of culinary applications for bay leaves, although extracts of bay leaves have numerous medical applications for topical application. It is also a popular element of aromatherapy and herbal treatments for various skin and respiratory conditions. 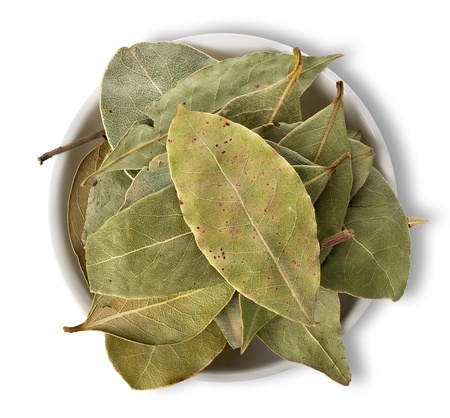 Bay leaves have a very strong effect on the gastrointestinal system, both stimulating urination as a diuretic, which decreases the toxicity of the body, but also stimulating vomiting (as an emetic) when something toxic has been consumed. Furthermore, the organic compounds found in bay leaves are very effective for settling upset stomachs, soothing irritable bowel syndrome, or even lessening the symptoms of Celiac’s disease. Some of the more complex proteins in our modern diet can be difficult to digest, but the unique enzymes found in bay leaves help to facilitate efficient digestion and nutrient intake. When the essential oil of bay leaves is extracted, it can be mixed into a salve and applied to the chest to help alleviate various respiratory conditions. This can also be achieved with a poultice made of the leaves. Spread it on the chest and allow it to remain overnight. Inhaling the vapors has a similar effect to aromatherapy and can loosen up phlegm and eliminate dangerous bacteria that may be trapped in your respiratory tracts thanks to its natural antibacterial quality.